The N1100 switch series offers a power-efficient Gigabit Ethernet (GbE) network-access switching solution with integrated 1GbE and 10GbE uplinks. With high-performance capabilities and wire-speed performance, utilizing a non-blocking architecture to easily handle unexpected traffic loads, the switches offer simple management and scalability via a 1Gbps (full-duplex) high availability stacking architecture that allows management of up to four switches from a single IP address. Fanless operation on select models, and features such as Energy-Efficient Ethernet and short cable detection provide energy efficiency to help decrease power and cooling costs. Modernize campus network architectures with a power-efficient and resilient 1/10GbE switching solution with up to 24 PoE/PoE+ ports. PoE power budgets up to 375W deliver clean power to network devices such as wireless access points (APs), Voiceover-IP (VoIP) handsets, video conferencing systems and security cameras. 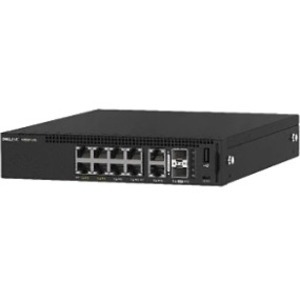 All N-Series switches include Dell EMC Networking OS 6, designed for easier deployment, greater interoperability and a lower learning curve for network administrators. One common command line interface (CLI) and graphic user interface (GUI) using a well-known command language gets skilled network administrators productive quickly. The N1100 switch series also supports the Open Network Install Environment (ONIE), enabling installation of alternate network operating systems.